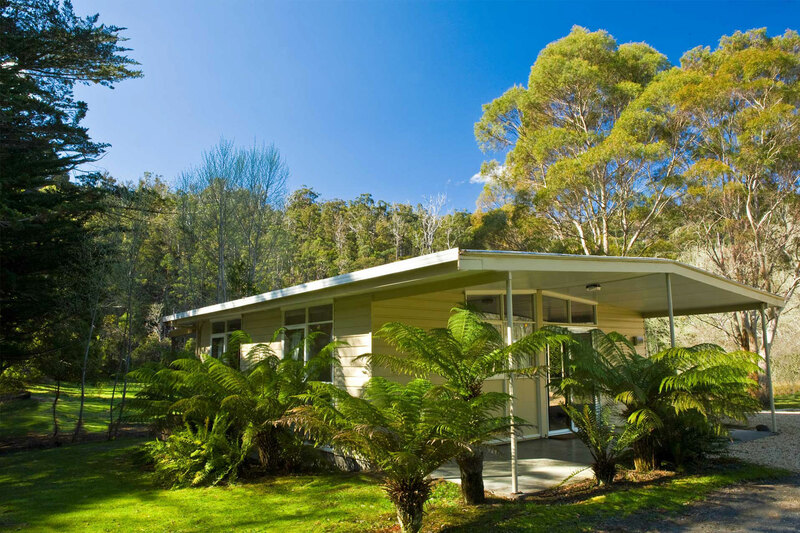 Russell Falls Cottages offer self-contained, self-catering accommodation suitable for couples and families. Four cottages – each set a comfortable distance apart – feature contemporary interior styling with open-plan living, mountain and forest views, and ample natural light. The Cottages are ideally located. The Tyenna River is at the bottom of the garden, where pademelons and other wildlife are frequently seen. In Summer it is possible to swim in the river and glimpse platypus. A footbridge across the river leads directly to Mount Field National Park, with the National Park Visitor’s Centre and Cafe, the Charles Marriott Shelter (BBQ facilities and children’s playground), and Russell Falls minutes walk away. The path passes through temperate tree fern rainforest, populated by glow worms. Fully-equipped kitchen with minibar fridge, small microwave, 4 plate electric stove top and fresh spring water on tap. Open-plan dining/lounge with flat screen digital TV/DVD. Bath and bed linen provided. Laundry facilities including washing machine, clothes dryer, iron and board, vacuum cleaner. One bedroom with double bed, fold-out double sofa bed in lounge. One bedroom with double bed; one bedroom with a single bed, one bunk bed (1 on top, 2 ppl below), and a pullout bed on casters. The lounge also features two fold-out double sofa beds. One bedroom with one double bed and a bunk bed (2ppl). Fold-out double sofa bed in lounge. Cottages are cleaned prior to check-in. Additional cleaning and housekeeping can be arranged for a small fee.